People have sat on something since they descended from the trees. A three legged stool is probably the earliest form of seat furniture, no back or arm rests and always stable though not necessarily level. The Vela Salsa sit-stand chair is at the opposite end of the spectrum. I want to tell you why the Vela Salsa sit-stand chair is in a league of its own. I am medically retired. This has led to a few very irritating problems. I cannot walk unaided and I’m liable to fall over because my balance is atrocious. I cannot stand up and talk to someone for more than a couple of minutes. If your walking or balance is not challenged then it is very difficult to comprehend these problems. I enjoy cooking meals for the family but there are a couple of small problems caused by the MS. Cooking means you must stand on your feet and be able to get things out of cupboards at all sorts of heights. This all became too difficult when I fell over too often so I had to quit the kitchen. The Wife had yet another job. I bought a simple Saddleback stool that is on five casters and it swivels. A useful feature is that you can change the height of the stool very easily. It is possible you have seen one in a dentist’s surgery or hairdressing salon. Fantastic if you have good core muscles and two functioning legs. I have been lent a VELA Salsa sit-stand chair for the disabled and I can compare it with my simple Saddleback stool. It’s a bit like comparing a Rolls-Royce Silver Cloud to a Volvo V60 estate car. Top end luxury as opposed to a good functional car. So what puts the VELA Salsa hi-lo chair in a different league. Firstly it is incredibly stable. The handbrake to lock the wheels so it cannot move around is a big plus. Other big advantages include the large rubber wheels. Our kitchen is tiled and the casters of the Saddleback stool can get stuck in the grouting between the tiles on the floor. No such problem with the VELA Salsa sit-stand chair. It is comforting to know the armrests are there. The armrests prevent me accidentally tipping off the stool. 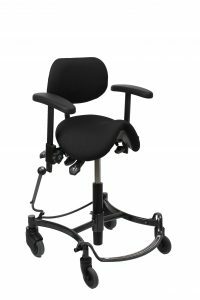 There are other nice ‘to-have’ features such as an adjustable backrest and a facility to adjust the tilt of the seat. It does not look like a cheap functional item designed for a physically disabled person. The height adjustment is excellent. You can have a conversation with nearly anyone and your eyes are level with theirs. It is also possible the lower the seat far enough to sit a traditional dining table and eat a meal. The VELA Salsa sit-stand chair does have a big footprint I would not use it in a small room. In our kitchen there is plenty of space. The chair is stylish and very comfortable. When it is returned to VELA it will be sorely missed. It looks brilliant Patrick. I wish they’d been around when I was still living at home and not in aged care. My EDSS is 8.5 so I know only too well what you’re having to cope with Patrick. Can’t see the price on their website ? Like any quality product they don’t quote the price upfront. The final price depends upon the add-ons etc. Etc etc. but I think they start at about 500. Will you not keep the chair Patrick? It looks excellent! What’s the retail price? yup I get to keep the chair and I’m helping out at the 0T show in Birmingham on November 21.